HomeFAQWaste Tyre Recycling Pyrolysis PlantHow to set up a tire recycling pyrolysis plant? 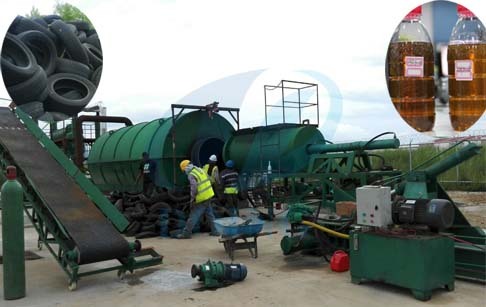 How to set up a tire recycling pyrolysis plant? A. How to collect waste tires or plastics? Collect by yourself or directly buy from the tire collectors? B. How much do you need to pay for the waste tires or plastics? Like in China, we need to pay 200-300 dollars for one ton waste tires, and 600-700 dollars for the plastics, which is very expensive. But in Latin America, like Mexico, for one ton tires, it only cost about 30 dollars or free. And even in some countries, if you can dispose the waste tires and plastics, the government will pay you. C. How to deal with the final products? Sell them or used for yourself? D. If you want to sell out the products to get money, how much can you sell? How about the profit? 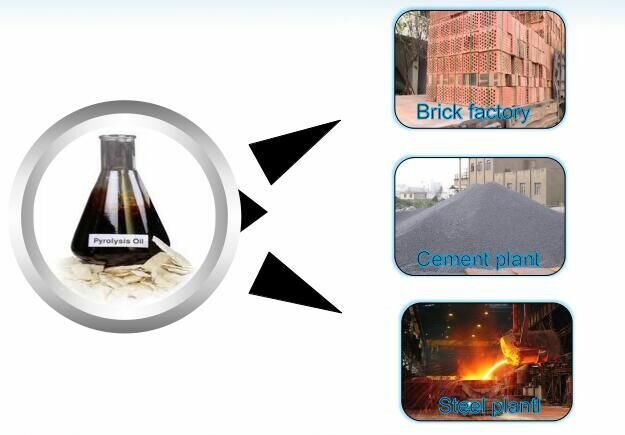 This oil product is a kind of crude fuel oil, which can be used for industrial heating used in any fuel needed industrial factories, such as cement plant, steel mill, glass factory, brick factory, boiler used factory, etc. Or can be refined to diesel, directly used in diesel burners, generators, heavy trucks, agricultural machinery, and mix with normal diesel used for light engine vehicles or machinery. Carbon black produced from this system is crude powdery material, which can be directly sold to cement factory mix with cement for high strength. Or made into briquettes used for burning and heating, just like coal. Or grinded into finer powder used as additives for making paint, printing ink or rubber products. Scrap steel wire can be directly sold to iron recycling station or steel mill for further treatment. 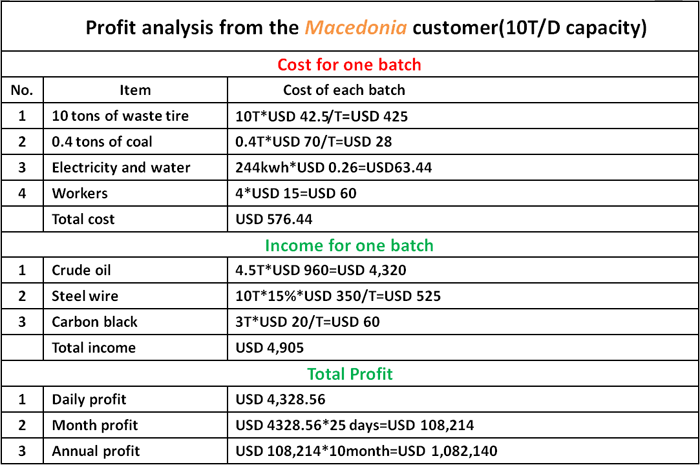 Here I have the profit analysis made by our Macedonia customer. Below please check it for your reference. (Note: This analysis was made in 2012, the statistics are not new. For one set waste tire recycling pyrolysis plant , it needs about 35m*15m land to be installed. And for one set distillation plant, it needs about 20m*15m land. If you already had the workshop, the height should be at least 6m. And don’t forget that you need to reserve the land for storing the waste tires/plastics and the final products. Besides, for the pyrolysis machine, it will need some underground foundation works. It’s better not to make floor pavement. But if you already made, it’s also no problem. We can also make the above ground foundation. 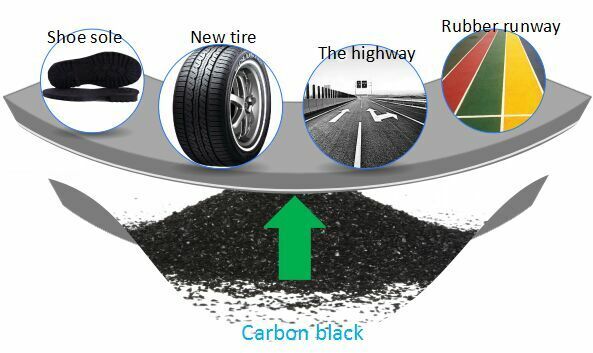 There are mainly 4 possible sources of pollution for the waste tyre/plastic pyrolysis system, and they are respectively Water Pollution, Air Pollution, Bad Smell and Noise Pollution. The water used in our pyrolysis and distillation system is all for recycle use, no need to discharge and change. The emissions from our system before discharged should be cleaned by our odor removal and dedusting system, after cleaning it has no pollution materials, just like water steam. The noisiest part of our machine is the drat fan. Its noise is less than 50db. 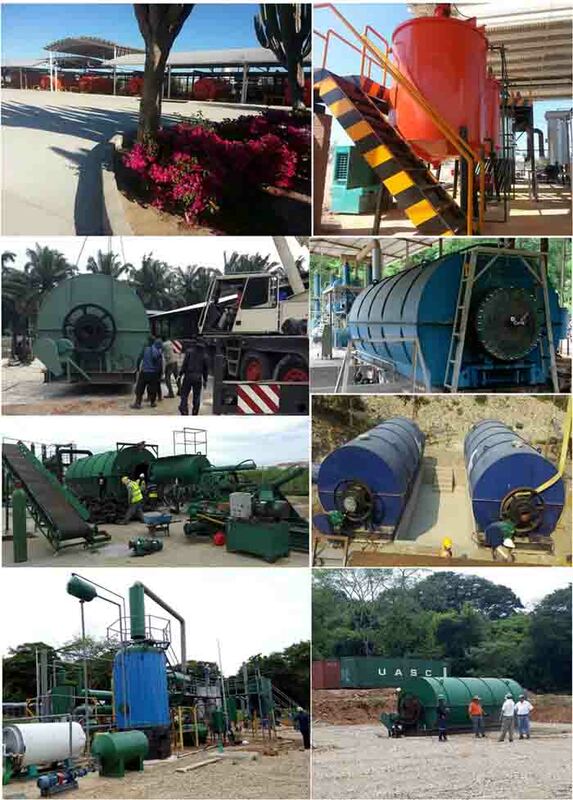 We DOING Company as a leading company for manufacturing and supplying waste tire and plastic recycling machinery has specialized in this field for almost 11 years, 4 years for domestic market, 7 years for international trade. America: Mexico, Ecuador, Haiti, Guatemala, Aruba, Panama, Jamaica, Colombia. And we have very professional engineers which can sent to your site for machine installation, commissioning and training your workers. prev: How much does a waste tyre pyrolysis plant cost? Next: How to produce oil from tyre?